Bulbs 1 or more, clustered, short-rhizomatous at base, cylindric, elongate, 0.5-0.9 × 1.5-2 cm; outer coats enclosing bulbs, grayish or brownish, persisting as fibrous reticulum but often appearing membranous as outer coats are lost during collecting, cells minutely striate; inner coats whitish or pinkish, cells closely parallel, elongate. Leaves persistent, green at anthesis, usually 2, distalmost usually ensheathing 1/3-1/2 scape; blade hollow, terete, fistulose, 20-60 cm × 2-7 mm. Scape persistent, 2-12+, clustered, erect, terete, fistulose, 20-50 cm × 3-5 mm. Umbel persistent, erect, compact, 30-50-flowered, ± subglobose, bulbils unknown; spathe bracts persistent, 2, 3-7-veined, lanceolate to broadly ovate, ± equal, apex short-acuminate. 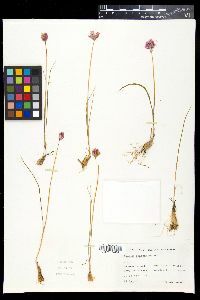 Flowers campanulate, 8-12 mm; tepals erect, pale purple to deep lilac, drying pink, particularly on midrib, or white, elliptic to lanceolate, ± equal, becoming papery in fruit, permanently investing capsule, margins entire, apex acute to acuminate, tips ± recurved, midribs not thickened; stamens included; anthers purple; pollen white; ovary crestless; style linear, equaling stamens; stigma capitate, unlobed or obscurely lobed; pedicel 2-6 mm. Seed coat shining; cells minutely roughened, not pustuliferous. 2n = 16. Flowering Jun--Aug. Wet meadows, rocky or gravelly stream banks and lake shores, circumboreal; 0--3500 m; Alta., B.C., Man., N.B., Nfld. and Labr., N.W.T., N.S., Nunavut, Ont., P.E.I., Que., Sask., Yukon; Alaska, Colo., Conn., Idaho, Maine, Mass., Mich., Minn., Mont., N.H., N.J., N.Y., Ohio, Oreg., Pa., R.I., Vt., Wash., Wis., Wyo. ; Siberia. 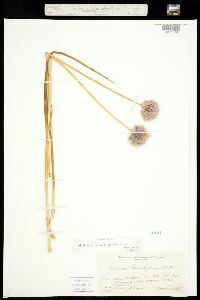 Allium schoenoprasum is native in North America, but it is also cultivated and has widely escaped. It is an extremely polymorphic species, and throughout its range both large and small races occur. 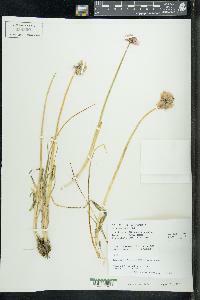 These plants have been known as A. sibiricum, A. schoenoprasum var. 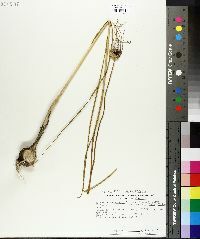 sibiricum, or A. schoenoprasum var. laurentianum, and many, largely unsuccessful, attempts have been made to distinguish the varieties. 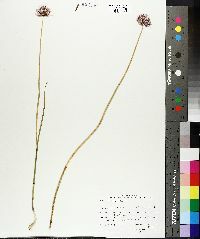 Until the variation can be worked out along natural lines, if any, instead of unstable features such as plant size, and color and shape of the tepals, recognition of these varieties is unsound. Because we are unable to separate native populations from many of the escaped ones, we cannot reliably map the native distribution of this taxon in the flora. Perennial herb with one or more bulbs flowering stems two to twelve or more, 20 cm - 0.5 m tall Leaves: usually two, mostly basal, upright, 20 cm - 0.6 m long, 2 - 7 mm thick, cylindrical, hollow. Inflorescence: an upright, rounded, compact umbel of 30 to 50 flowers raised on a single hollow stalk and subtended by two persistent bracts. 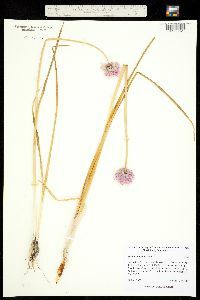 Flowers: on 3 - 7 mm long stalks, deep lilac to pale purple, drying pink or white, 10 - 14 mm long, bell-shaped, with six pointed tepals that become papery and surround the fruit. Stamens six. Anthers purple. Fruit: a short, three-lobed capsule. Bulbs: clustered, up to 9 cm tall, slender (scarcely thicker than stem), cylindrical, and encased in a brownish or grayish fibrous netlike coating (appearing membranous if outer coat is lost during collection). 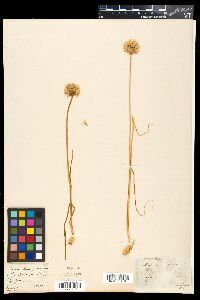 Similar species: The cylindrical, hollow leaves and non-inflated stems of this species and Allium vineale help distinguish them from other Allium found in the Chicago Region. 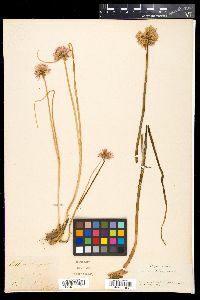 Allium vineale differs from A. schoenoprasum by having leaves that extend to nearly the middle of the stem and an umbel that produces bulblets. Habitat and ecology: Introduced from Europe. An occasional escape from cultivation. 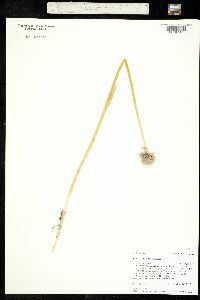 Has been found growing in grassy areas and along a railroad. Etymology: Allium comes from the Latin word for garlic. Schoenoprasum means Rush leek. Bulb slender, often scarcely thicker than the stem; lvs erect, terete, hollow, mostly cauline, 2-4 mm thick, the longest nearly equaling the stout, 2-5 dm stem; umbel compact, hemispheric, subtended by 2 ovate bracts; pedicels 3-7 mm; fls numerous; tep bright pink, ovate to lanceolate, 10-14 mm, acuminate, prominently 1-nerved; filaments all about alike, barely widened at base; fr ovoid, 3-lobed, half as long as the perianth; 2n=16, 24, 32. Circumboreal, in Amer. s. to Me., n. N.Y., n. Mich., Minn., Colo., and Wash. June, July. Our native plants, as described above, are var. 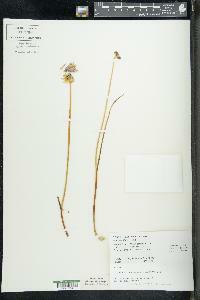 sibiricum (L.) Hartman. Var. schoenoprasum, a much smaller European plant only 1-2 dm, with the lvs basal and only 1-2 mm thick, is the cult. chives; it rarely escapes in our range.